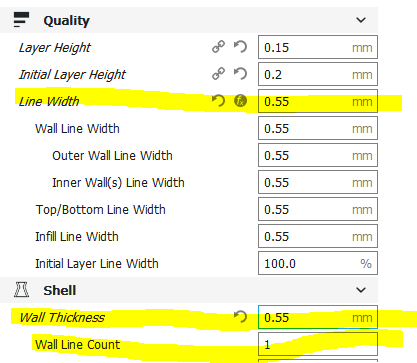 I need help resolving some conflicting logic between the nozzle width and shell thickness--parameters in Cura 16.021--and the physical deposited line width (width on x-y plane). Deposited line width - width of the rectilinear layer deposited on the build surface in the x-y plane (not the z-layer height). 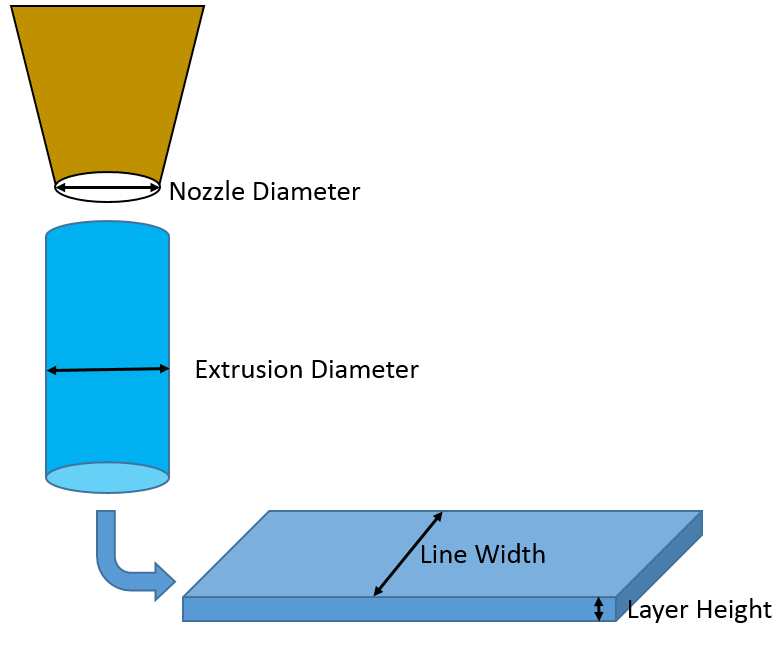 Physics suggests that for regular continuous flow out of the nozzle the extrusion diameter (cylindrical material extrusion) would be slightly larger than the nozzle diameter, and the deposited line width (rectangular prismatic extrusion) on the x-y plane should be even wider than the extrusion diameter. I'm assuming the deposited line width is equal to the shell thickness as set in Cura. However, I am finding conflicting advice as to whether one should set the shell thickness slightly greater than or slightly less than the nozzle diameter. In this post on the Ultimaker forum, the moderator seems to suggest that the nozzle size and deposited line width are one and the same. In this post on StackExchange, the discussion seems to agree with my understanding. A commonly referenced procedure for calibrating extrusion suggests printing a 25mm cube with an open top and bottom. 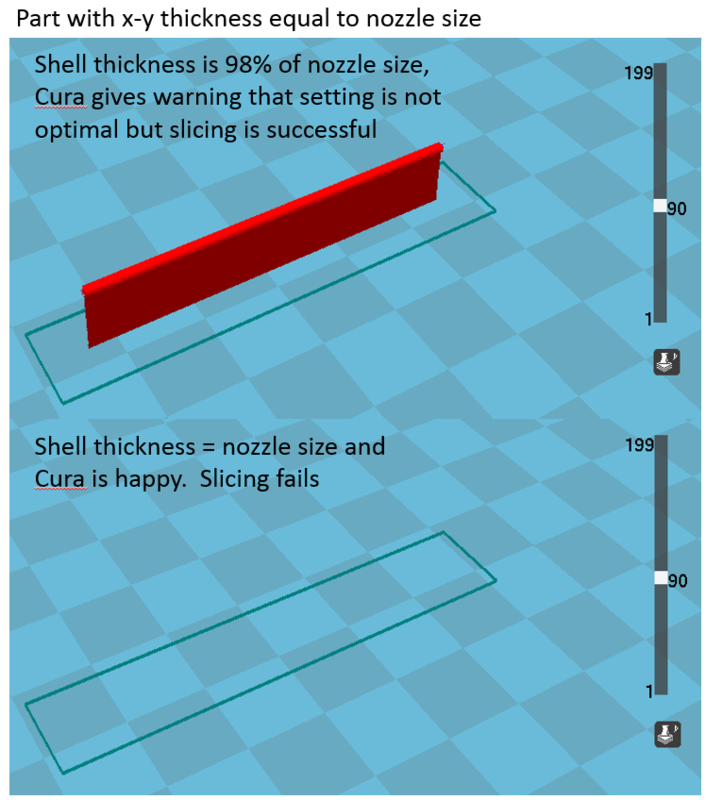 My understanding is that by printing four walls of a single shell thickness, we should correct the extrusion rate to achieve a deposited line width equal to nozzle diameter (Cura requires the shell thickness to be a multiple of nozzle diameter) . The problem I have with this is, as stated above, I don't understand a physical basis for targeting nozzle size = shell thickness (deposited line width). I'd expect to calibrate the extrusion to something slightly wider than the nozzle diameter. My printing experience seems to confirm my intuition. If I reduce extrusion rate to achieve shell thickness = nozzle diameter my prints appear visually under-extruded with poor layer adhesion. Calibrating to about 110% of the nozzle size looks about right. Although Cura constrains shell thickness to be a multiple of nozzle size, it will not slice thin shapes on the x-y plane equal to nozzle size, they need to be slightly wider. I have verified this multiple times by designing a part in SolidWorks with a 0.4mm wall, exporting it to Cura as an STL, and previewing the slices (using a 0.4 mm nozzle size). If I increase the wall thickness in the model to 0.41mm, Cura will slice the wall. This seems to suggest to me that Cura does account for a deposited line width > nozzle diameter. It calls to question whether the shell thickness is actually a physical dimension for the 3D print or just a parameter for the slicer engine. I have taken it to mean the number of passes around the perimeter in units of nozzle size, similar to other slicers that ask for a shell count. Thanks in advance to anyone who has put in the time to read this post and kindly share some knowledge. EDIT 1: My interchanging of terms "width" and "thickness" made it sound like I'm referring to z-layer height. Also, Trish pointed out that "line width" is the better term rather than "layer width" so I have updated this. My post is only concerned with the deposited layer width in the x-y plane--"line width". This seems to decouple the line width from the specified nozzle size and target what I believe is a more optimal width (~110% the nozzle diameter). It was the other version of Cura that was driving a lot of confusion with the line width being defined by the nozzle size. This also removes the weirdness of not being able slice lines equal to the line width. There may be die swell, which will depend on the extrusion force, the material type, and the exact temperature within the hot end. This is because the viscosity is highly dependent on those parameters. As to line width: again extruded temperature, material, ambient temperature, cooling fan coverage all play into how much "sag" takes place before the material hardens. Oh, and X-Y speed of the nozzle, of course. Further, for the first layer, if the nozzle is nice and close to the bed, the nozzle itself will force the material to spread laterally while limiting the vertical extent. Personally, I don't think it's worth the effort to create a mathematical model. Spend the 3 cents' worth of electricity, 0.01 cents' worth of material, and 15 minutes of time to calibrate if desired. Not the answer you're looking for? Browse other questions tagged cura slicing or ask your own question. How does the sizes of nozzle diameter and the Z-axis layer resolution work? Why does Cura insert G0 commands between G1 commands while Slic3r doesn't? Can I use a 0 mm top layer thickness in Ultimaker Cura to create an open box? Why is it conventional to set line width > nozzle diameter?